The newly redesigned VelociCalc Multi-Function Ventilation Meter Model 9565 from TSI Incorporated is now available locally from Kenelec Scientific. TSI Incorporated is a 50 year long worldwide leader in performance measurement solutions. The VelociCalc ventilation meter is a top of the range, multi-functional anemometer that accurately measures elements such as air velocity, air flow, temperature, humidity, and pressure simultaneously. The graphical display flaunts 5 parameters and has onscreen messages with international language customisation. 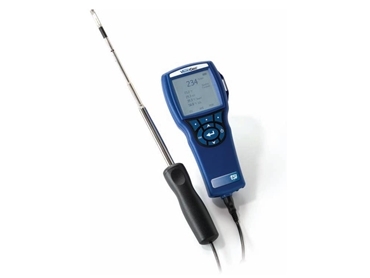 The Model 9565 ventilation meter is flexible enough to handle a wide range of additional measurement applications with “smart” plug-in probes and sensors, including VOC, CO2, and rotating vane probes. Measurement applications such as HVAC testing and balancing, clean room testing, biological safety cabinet and laboratory fume hood testing, IAQ investigations, and many more are applicable to the VelociCalc. Equipped with LogDat2 downloading software and TRAKPRO Data Analysis Software, the new VelociCalc Ventilation Meter Model 9565 allows for easy data logging, recall, review, and downloading of up to 38 days of stored data for robust documentation. Wireless Bluetooth technology makes reporting convenient and effortless by further allowing remote polling and onsite wireless printing.